The main working creative space is, of course, the loungeroom. Its just warmer and friendlier. Theres a stereo and a fire... This week I taught myself to needle felt. The big owlet demanded a faerie with purple hair and a pink dress. Next she wants a horse... hmmmm....Of course, no creative space (at my house anyway) is complete without a cup of Earl Grey. Brunch today is the crust from today's bread (still warm!) with our own jam, a pineapple and banana muffin and an apple. Yep, there's that knitting too. Still getting to that! 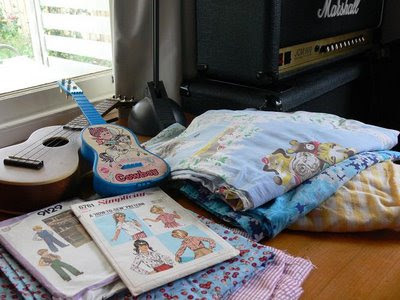 Pop over to Kirsty's for some other creative spaces. This looks very inviting ~ and yummy! Oooh, your brunch looks sooo yummy! And warm and toasty. Love your space, it's gorgeous. The little blue guitar is gorgeous. Loved looking at your photos, so full of exciting objects to look at. You just make me want to come over for a cup of tea (from New Zealand)- I am an Earl Grey girl too. I love your new banner - it just looks beautiful! Your creative spaces look very inviting too, especially that cup of tea! Re: ET, could you make a couple of softies with some parts and maybe use the rest as pockets on bags... patches etc. The needle felting is terrific. How are your fingers?? I usually end up stabbing myself - and often! 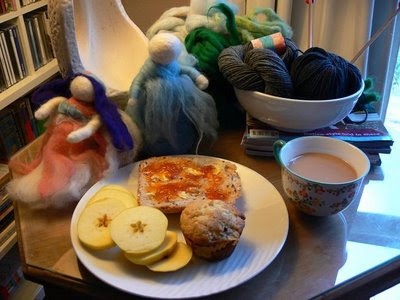 Ahh felting and a cup of tea. I know what I'd rather be doing right now! (on lunch break at work at present!) What a perfect space! your space is very cozy! i love your needlefelting - it's really fun isn't it?